This paper presents a layered approach to the design of private key cryptographic algorithms based on a few strategically chosen layers. Each layer is a conceptually simple invertible transformation that may be weak in isolation, but makes a necessary contribution to the security of the algorithm. This is in contrast to algorithms such as DES which utilize many layers and depend on S-boxes that have no simple mathematical interpretation. A property called transparency is introduced to deal with the interaction of layers and how they must be selected to eliminate system weaknesses. 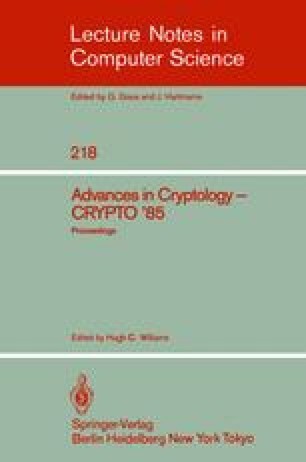 Utilizing this layered approach, a private key cryptographic algorithm consisting of three layers is constructed to demonstrate the design criteria. The algorithm has an adequate key space and valid keys can be easily generated. The design is based on a symmetrical layered configuration, which allows encryption and decryption to be performed using the same algorithm. The algorithm is suitable for VLSI implementation. Some statistical tests are applied to the algorithm in order that its cryptographic performance can be evaluated. The test results and attempts at cryptanalysis suggest that the three-layered algorithm is secure.